Kamituga is located on the 210 kilometer long Twangiza-Namoya gold belt that stretches out into Maniema Province. Gold deposits were discovered in the 1920s and the Belgian company ‘Minière des Grands Lacs Africains’ (MGL) started commercial gold exploitation in the 1930s (Geenen, 2014; Kyanga Wasso, 2013; Vlassenroot and Raeymaekers, 2004). Through a large recruitment campaign, MGL attracted its labor force from all over the province and even from Rwanda and Burundi (Geenen, 2014; Kyanga Wasso, 2013). 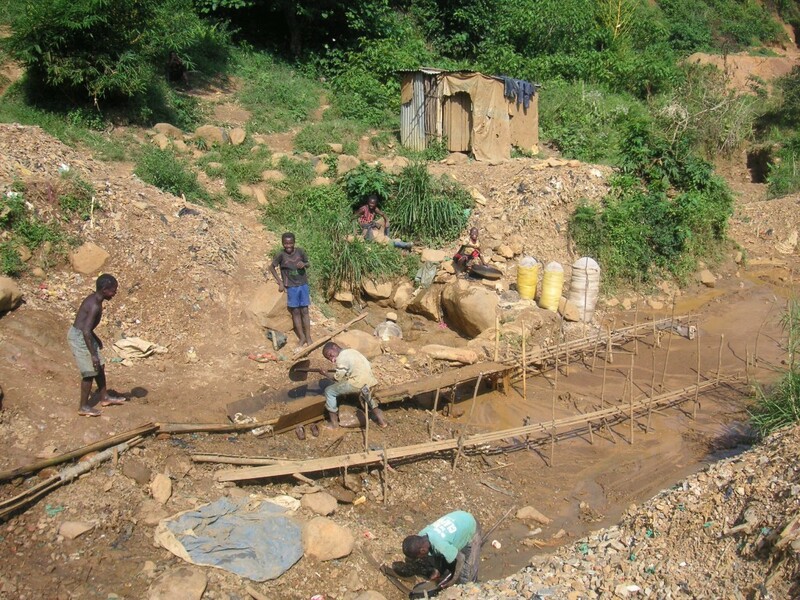 Throughout the 1960s, artisanal mining gradually developed in Kamituga. MGL workers realized they could supplement their meagre salaries by selling gold in an informal trading system, instead of handing it over to the company. For MGL it was difficult to halt such ‘illegal’ activities as artisanal miners and traders were to a certain extent protected by local political and customary elites (Geenen, 2014). The “problem” only grew bigger, as both the search for economic opportunities and the hope to get access to social services fueled Kamituga’s population growth. MGL also faced other challenges. In 1965 Mobutu took control of the state in a coup. Throughout the following decade, Mobutu’s economic policies (Zairianisation and radicalization measures), coupled with the instability of world mineral prices, led to a persistent economic crisis. The existing mining companies were forced to restructure their activities. In 1976, MGL merged into SOMINKI (Société Minière et Industrielle du Kivu) with 8 other mining companies (Vlassenroot and Raeymaekers, 2004). SOMINKI invested considerably in Kamituga, employing about 2,000 to 3,000 workers, constructing local infrastructures and providing social services (Geenen, 2014; Vlassenroot and Raeymaekers, 2004). Nevertheless, the informal trade in minerals continued to grow incessantly, and really boomed after 1982, when Mobutu liberalized the exploitation and trade in minerals. While rural populations were massively drawn towards mining areas, industrial mineral production strongly declined due to a combination of failed economic policies, decaying infrastructure and fluctuating world mineral prices (Geenen, 2014; Kyanga Wasso, 2013; Vlassenroot and Raeymaekers, 2004). During the two Congo wars (1996-1997 and 1998-2003) industrial production came to a standstill, while artisanal mining continued to expand. A sense of relative security and the hope to find economic opportunities in the informal mineral trade intensified the migration from rural areas to Kamituga, which saw its population more than double over the course of the wars (Geenen, 2014; Vlassenroot and Raeymaekers, 2004). In these years of turmoil, Kamituga was occupied by several armed groups which benefitted from the informal mineral sector by setting up systems of taxation for artisanal miners and traders. The occupying forces included the RPF (Rwandan Patriotic Front) in 1996, the AFDL (Alliance de Forces Démocratiques pour la Libération du Congo) later in 1996, the RCD (Rassemblement Congolais pour la Démocratie) from 1999 to 2003 and the FARDC (Forces Armées de la République Démocratique du Congo) (Geenen, 2014: p.114 – 118). 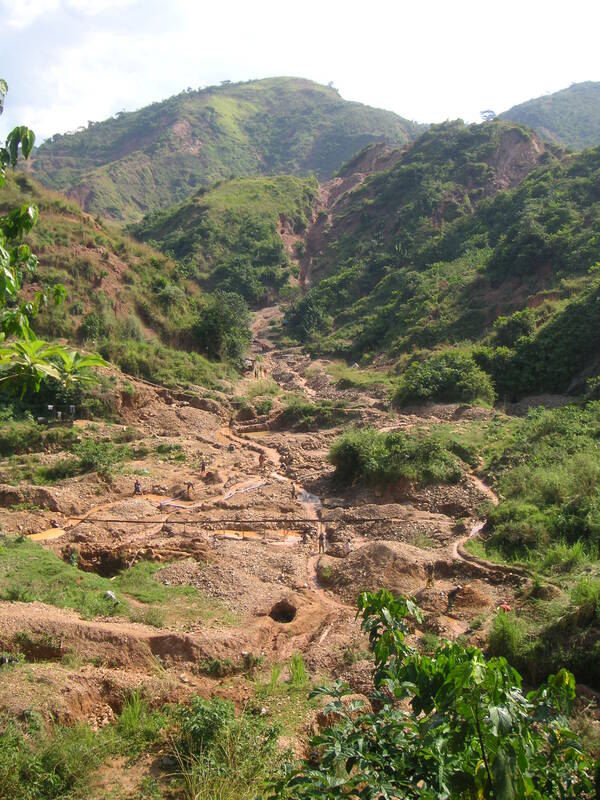 Just before the start of the first war, the Canadian mining company Banro had shown an interest in taking over SOMINKI’s failing gold mining sites. In 1997, SOMINKI was liquidated and its 13 exploitation permits for the Twangiza, Kamituga, Lugushwa and Namoya properties, were transferred to Banro (Geenen and Claessens, 2013). After coming to power in 1997, President Laurent Kabila chose not to honor the agreement. Instead, he created SOMICO (Societé Minière du Congo), which replaced SOMINKI and occupied the former offices in Kamituga. Banro tried to reclaim its concessions through legal mechanisms and, in 2002, finally reached a new agreement with Joseph Kabila – who came to power after his father was murdered. Banro thus regained the right to exploit minerals in the gold concessions of Twangiza, Kamituga, Lugushwa and Namoya (Geenen, 2014; Geenen and Claessens, 2013; Kyanga Wasso, 2013; Vlassenroot and Raeymaekers, 2004). According to the local administrator (Chef de Poste) of Kamituga, the latest population census estimates the number of inhabitants at 187.000. With close to 200,000 inhabitants, Kamituga is currently the third most important city of South-Kivu, after Bukavu and Uvira. Kamituga can be reached from Bukavu, via the Route Nationale 2 which has benefited from recent infrastructure works. 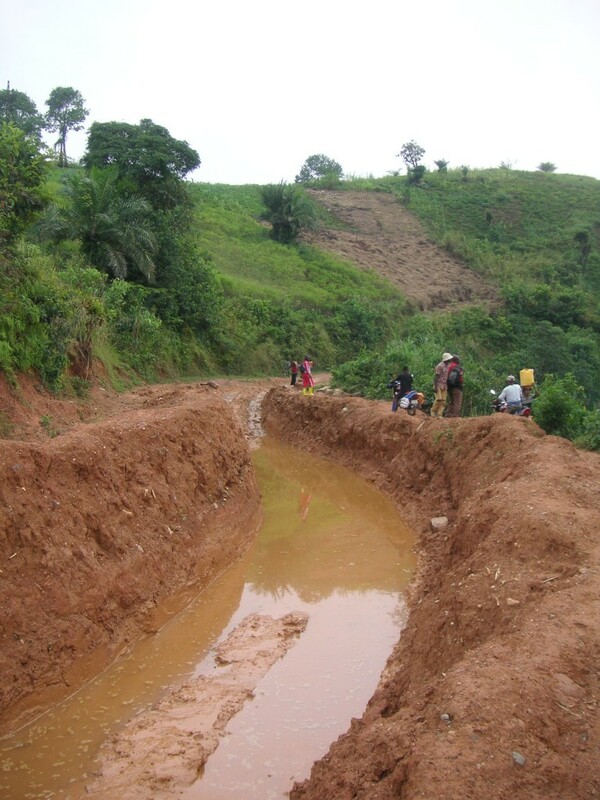 The road runs however through swampy areas and a lack of drainage may render it inaccessible in a matter of days. Large trucks with excessive loads often get stuck and are dug out. The so created holes further aggravate the drainage issues. The large majority of the population in Kamituga is either directly or indirectly dependent on mining activities. We counted close to 13,000 artisanal miners on a 2012 membership list which combined the members of all artisanal mining committees in Kamituga. This number should be considered an absolute lower-bound as it only takes into account the actual “gold diggers” and does not include the numerous other actors in the artisanal gold mining chain (most notably those who transport, crush and wash the ore-containing rocks; gold traders; and children engaged in alluvial mining). Many of our interviewees in Kamituga further stressed that everyone in Kamituga is a “gold digger”; referring to their impression that the entire economy depends on the money generated by the artisanal mining sector. Geenen, S., 2014. “Qui cherche, trouve” The political economy of access to gold mining and trade in South Kivu, DRC. Geenen, S., Claessens, K., 2013. Disputed access to the gold sites in Luhwindja, eastern DRC. Journal of Modern African Studies 51, 85–108. Kyanga Wasso, A., 2013. Sominki en liquidation: aide-memoire sur l’evolution de la societe à Kamituga. Sominki, Bukavu. Vlassenroot, K., Raeymaekers, T., 2004. 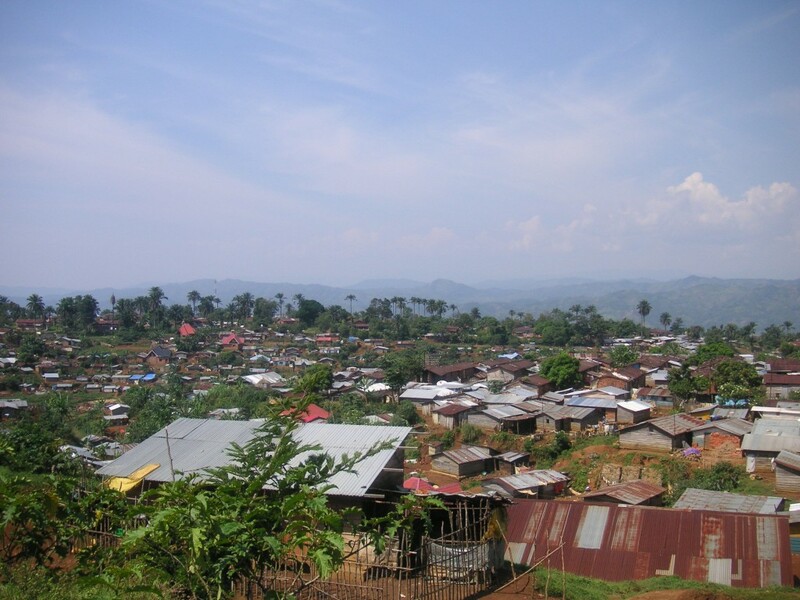 Conflict and social transformation in Eastern DR Congo. Academia Press Scientific Publishers, Gent [Belgium].